Why should I move from spreadsheet bookkeeping to using accounting software? I am often asked when businesses are new or fairly new, if they should do their bookkeeping in a spreadsheet and probably not sure why using accounting software like Xero could actually be beneficial. Yes doing a spreadsheet may save you a bit in not having any software costs. But isn’t the time you spend on developing a spreadsheet that does what you need also a cost. After all you are probably reinventing accounting software in your spreadsheet and probably not doing as good a job as the accounting software companies who spend thousands or even millions every year on developing and maintaining such software. A spreadsheet may take less time for your accountant to process into a tax return and even lead to a lower tax preparation fee. But on the flip side it may mean you are making more errors too. Not many spreadsheets reconcile back to your bank account for starters, so you may be leaving out some deductions or lack the proper framework to capture all expenditure missing some value tax benefits. Easy to send your invoices, allocate payments to them, send scheduled invoices, send statements, send reminder to pay messages, link to payment processors to accept more forms of payment. I love the regular invoices you can set up great for say a regular monthly service fee to a client, it can all be automated rather than you doing it manually in a spreadsheet. Doing your gst becomes more of a breeze, easier to check your BAS before processing, easier to code the relevant gst codes also. Setting up a bank feed means your transactions appear in your software complete with populated amounts and dates. All you need to do is point them to the right account or allocate the payments. Furthermore, the software remembers and learns how you have coded the same transaction in the past and suggests your coding. The bank feed really means you must still keep bank statements and invoices, but not get your hands dirty with them as much. Updating your daily transactions should take less time than a cup of coffee. Something no one ever says about using a spreadsheet. Being internet based your accountant can easily check in on your accounting, make a suggestion, collaborate with you or even keep you informed on how your tax position is looking this year. Of course there is no need to bring or even email your accountants your file at the end of the year, they can simply hop in once you give them access by email. There is no updating the software, it is all done for you. you simply can log in anywhere in the world with internet. There is no need to back up either. Let someone else worry about keeping your valuable data stored professionally and save some of your network or computer space too. Great reports. This is where your spreadsheets really struggle to even do a Balance Sheet. But Xero can give you so much from regular monthly management reports, to GST reporting, Payroll reporting, and finally fully formal interim reports which can go direct to interested parties like banks. Bank reconciliations are all taken care of ensuring less mistakes and omissions. Manage your cashflow at a glance on your dashboard page see what money is coming in and out. Integrated payroll. No need to keep separate records as it all works within the same software. Allow as many users as you wish to have access as delegated, from accountant role to read only access. Fairly simple to establish and setup the software, ease into an established and tested software, rather than evolving your spreadsheet. 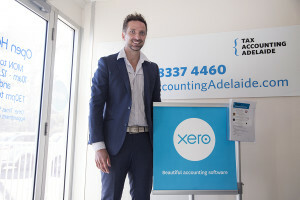 Your Xero is becoming so sophisticated it can mean one click away from Bas return, tax return and loan approval are what accountants properly using their software can offer. They can more efficiently and therefore more affordably offer your these services or give you more added value consulting elsewhere. Make your accounting a hell of a lot more fun. It makes it a breeze to keep it up to date, save you lots of time and actually look forward to your monthly reports. So as I always say a good business keeps a live scoreboard and knows how well they are doing – like the footy game knows the score and adjusts their game, so too a business should use accounting to grow their business. It depends on what features or subscription you need but the most common one is $50 per month. Our firm offers a $110 per month software and support package which includes implementation, training, monthly reports and coding your transactions. Speak about doing this for you? Then speak to us about make the seamless transition to a better accounting software, saving you time and money so you can spend time on more value adding activity. Call us now on 83374460 or book in on our website for a complimentary no obligation meeting now.